THIS is the grisly aftermath of the Camden fire, witnessed first hand by a Camden Town student who lost everything when his flat burned to cinders in the blaze. James Taylor, 28, could only watch from behind police cordons as the fire tore through his flat on Camden High Street, which he rents with his younger sister. But photos he took days later on a salvage mission offer an unseen glimpse behind the scenes of the charred properties, and the true extent of the devastation. The second year Central St Martin’s architecture student lost thousands of pounds of equipment, including two laptops, several mp3 players and a £500 digital camera; plus his entire portfolio, and numerous clothes and personal items. He did not have insurance. Mr Taylor is currently out of house and out of pocket, staying on a friend’s sofa in Kentish Town with no water or heating. Last week he missed out on a job interview because he had no work to show. Mr Taylor also called into question the “cold” attitude of police and fire crews at the scene. 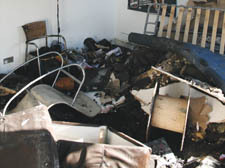 His sister, Kelly, was in the flat, about to go to sleep, when the fire began. A Camden police spokesman said: “Camden police responded to the fire, which was a critical incident, immediately and had a very large area to evacuate, on a busy Saturday night in the borough.